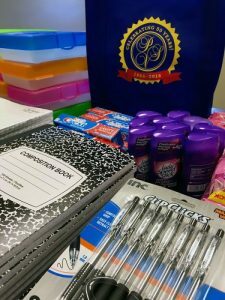 Supplies for the goody bags we are donating to T&E Care. In honor of our 50th anniversary, Paoli Village Shoppes is supporting T&E Care, an organization that helps needy kids and families in Tredyffrin and Easttown townships. T&E Care assists local families with finding jobs, purchasing school supplies, obtaining their GED, and more. As part of our PVS 50 Kids for Our 50th event, Paoli Village Shoppes will donate 50 goody bags so T&E Care can help supply children in need. The bags will be filled with school supplies and other essentials. To further support T&E Care, we will be accepting donations leading up to the annual Paoli Blues Fest, which is on October 1st. The day of the fest, keep an eye out for our PVS 50 Kids for Our 50th Team! We will have a dunk tank, 50/50 raffle, and prize wheel. Paoli Village Shoppes will donate all proceeds to T&E Care. We hope to see you at the fest Saturday, October 1st. Don’t forget a nonperishable food item for the Chester County Food Bank: your entry fee to the fair.